Eight years ago this June, my wonderful wife and I got married. 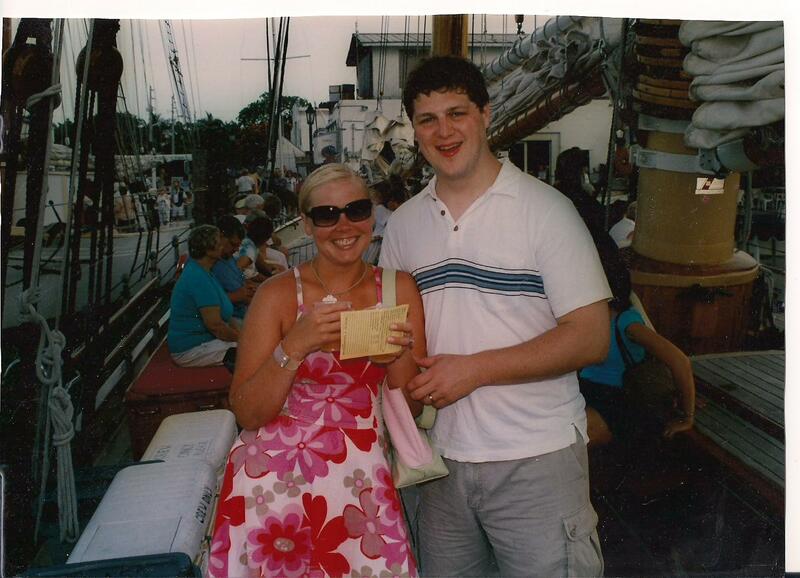 We took a flight the next day to Miami and drove three hours to Key West, Florida for an amazing week-long honeymoon. While there, we stayed at the Pier House and ate dinner at their excellent restaurant. Pier House, incidentally, makes the best Bloody Marys that I’ve ever had. Ever. During a walk around the island, we came across a bar that was only accessible by walking on the docks past the many boats that were moored. It smelled great, had a wonderful atmosphere, and we saw some wild chickens running around on the chat rock floor of the outdoor dining area. Some 100 year old Dominican guy was hand-rolling cigars while his grandson peddled them to patrons. We had discovered Schooner Wharf Bar. Later in the week, we would have dinner there before a booze cruise. Unfortunately for my new wife, she boozed in advance of the booze cruise and was a wreck by the time the sunset boat ride was over. Oh well, you only live once. The Schooner Wharf waiter recommended Kalik, a mediocre, thin beer. Being so watery, it was quite refreshing. Among the many specialty items, the waiter recommended Dolphin. Yes, he said dolphin. Now, my knowledge of protected animals is not strong, but my initial inkling was correct: You cannot kill and eat dolphin in the US. Still, I was down for chowing on some Flipper. The waiter corrected me, as he probably has corrected at least one idiot tourist per hour. Dolphin fish is another term for Mahi-mahi. I checked out their menu and it sounded appetizing. It was more delicious than we could imagine. Not sure what was in the sauce or how they got it to cook so nicely, but it was exquisite. We came back several more times for this sandwich and some Bahamian beers. Why not try to replicate or at least come close to this honeymoon experience? I think I’ll pass on the Kalik, though. 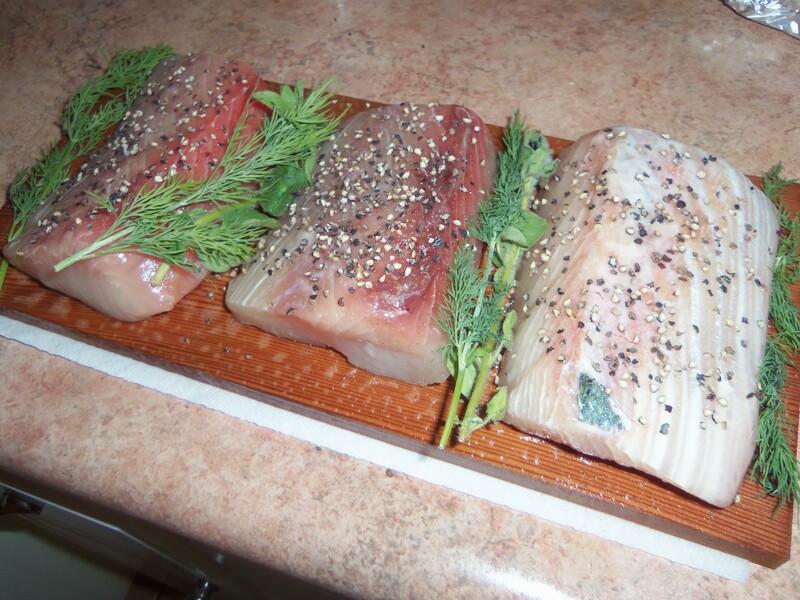 I’ve got some really nice Mahi-mahi filets from Bob’s Seafood in U. City, MO. They will get a healthy dose of cracked pepper and salt, followed by a place on a wood soaked, Pam-coated, cedar wood plank. This is set over medium direct coals on the Weber 22″ grill. 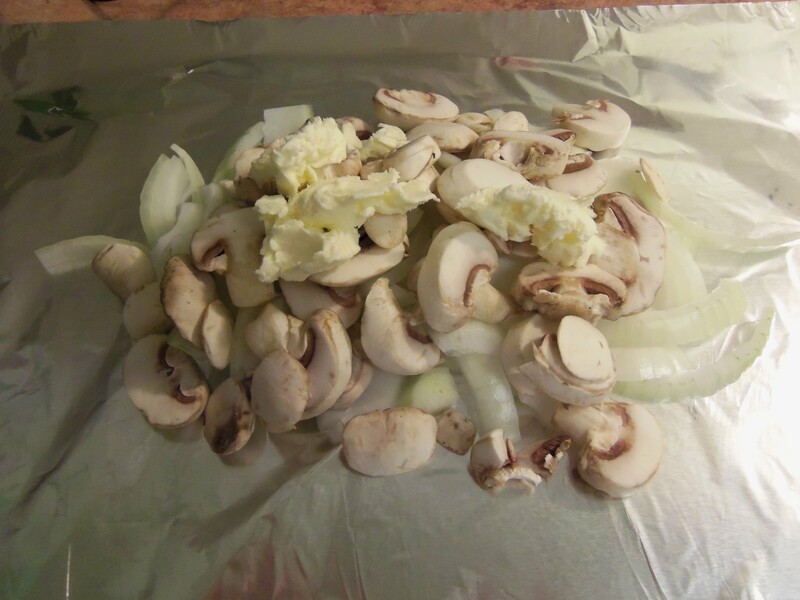 Alongside the fish, I made a foil pouch for the chopped mushrooms and sweet onions, with some butter to help cook. I can toast some buns on the side, and we have cheddar cheese ready to go. I prefer the flavor and texture of cheddar over the oiliness of American. Now for this mango sauce. I remember it being a mango aioli. I have a pretty good idea what I want to do, but to get some input from the internet, I did a quick Google search. Who would have guessed that Mango Aioli is also the name of some techno DJ from Germany. He’s an, um … distinguished-looking gentleman. Aioli is really just a mix of olive oil, egg, garlic, spices, and other stuff. If I can get some mango preserves or jelly and mix in some mayonnaise, dill, pepper, olive oil, etc., perhaps something appetizing can be made. Most unfortunately, my lovely wife’s trip to the store did not result in any mango preserves. Instead, I was given some mango salsa. We were also out of olive oil and garlic. I tried to make something out of mayo, the salsa, some dill, lemon juice, hot sauce, etc. It was utterly deplorable. I guess I can do without the sauce. Each side of the fish got some salt and coarse cracked pepper. I added some sprigs of dill and oregano for a little extra flavor. It all went on a water-soaked cedar plank. The fish is cooking nicely. 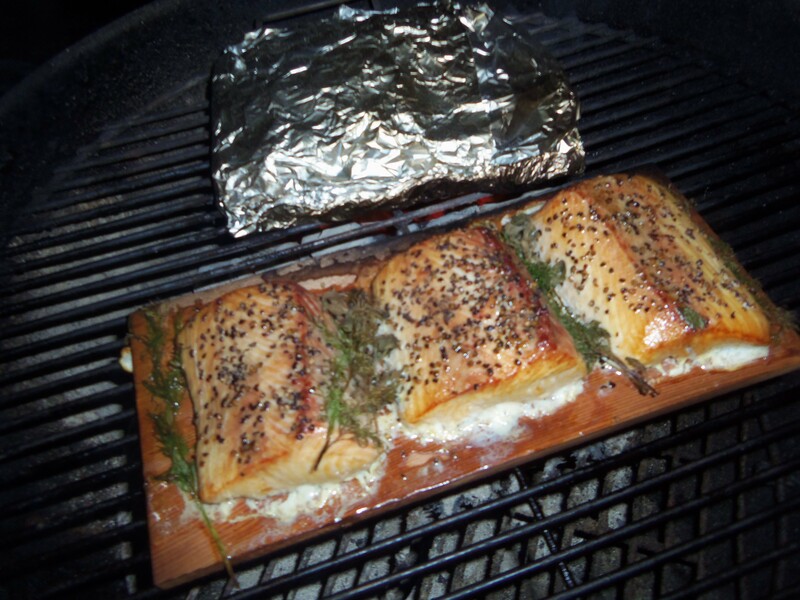 I let the cheese melt over the fish, right on the plank. What a wonderful combination of smells from this BBQ. A huge slice of cheese went right over each piece of fish for a few minutes to finish. 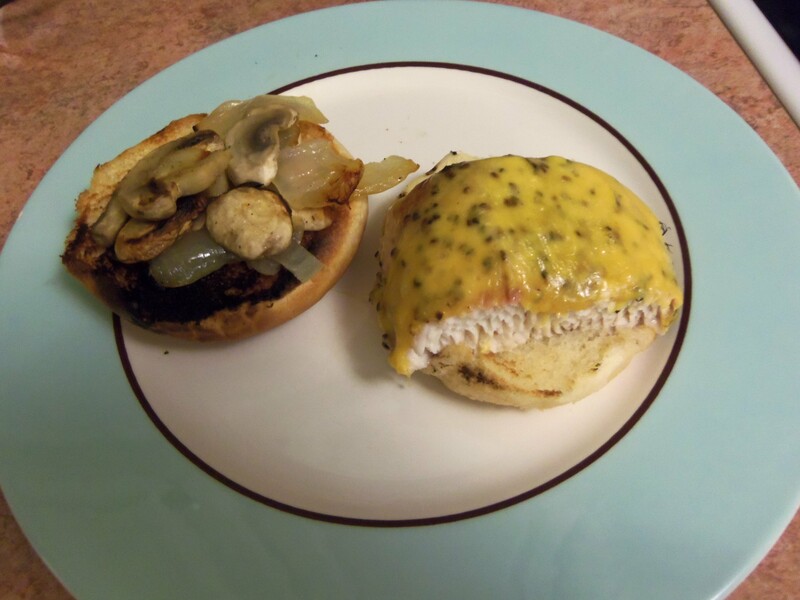 Once it was all done, I toasted each bun half for about 60 seconds total. I’m pleased to report that these did not need any mango sauce. I have to wonder what enhancement could have been made by adding them, but the sandwiches were delicious. 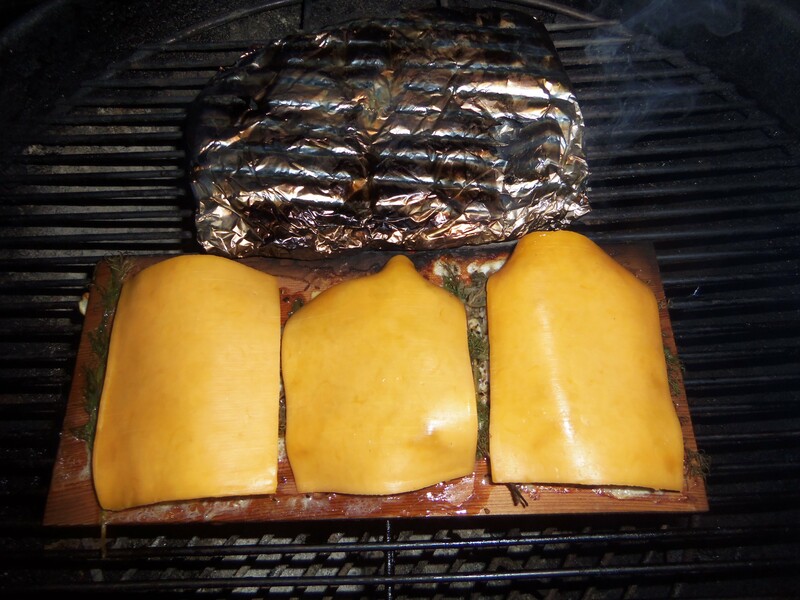 The cheese and the fish both picked up some great smokiness, while the mahi-mahi itself remained flavorful and flaky. Salt and pepper were enough for seasoning, though I suspect that Schooner Wharf put on some kind of jerk seasons. What an amazing dish. We stuffed ourselves while having some Schlafly Summer Helles Lager. I didn’t miss the Kalik at all, or the mango sauce. I did keep a small dollop of tartar sauce on the side, but didn’t use much at all. Amazingly, the last filet, after being wrapped up into a sandwich, held wonderfully overnight in the fridge and made an excellent lunch. To complete our honeymoon experience, in lieu of a booze cruise on a 200 year old wooden clipper ship, my wife and I chugged some beers and went on a Forest Park paddleboat ride around the lagoons that surround Art Hill. Okay, not really, but that would have been cool.